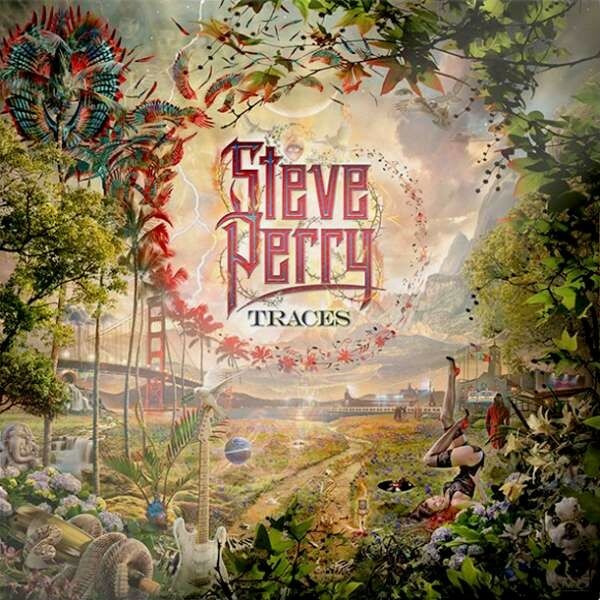 The return of Steve Perry! 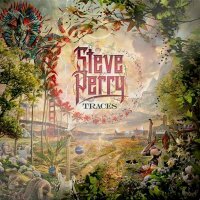 Such is the rarity of new work from Perry, I have been writing for twenty-two years and only covered one release, Journey's 'Trial By Fire', but here we are; 'Traces' is the new album, a ten track chronicle of Perry's recent life experiences with a fifteen track deluxe-edition available via direct online or USA Target stores. To many, me included, Perry is the voice of AOR; the definitive authority on just how good vocals can be. I'm not averse to being critical, but the pure excitement factor of just getting to hear his voice again is pretty strong. However, I'm pleased to say there's not much to be critical of here, provided fans understand the reality of Perry in 2018. The voice is rougher, raspier and it isn't as strong as it once was. However, that's almost stating the bleeding obvious. Who would be at this stage in their career? What I care about are the performance and the songs, and 'Traces' has a tick in each column. I can't imagine anyone is surprised to hear that this is a ballad-filled, slow to mid-tempo album, and while some may struggle with the pace, I doubt any long time Perry fan is going to be disappointed. Perry at seventy is still Perry. Just like hearing Neil Diamond at any stage in his career, so too is the joy of hearing Perry. It's that distinctive voice alongside those trademark inflections and that tone, plus that unmistakable delivery of mood and emotion that no-one does better. The characteristics and familiar style of Perry's past are all over this record. You can hear parts of 'Street Talk', 'Strange Medicine' and, of course, 'Trial By Fire' plus other Journey-isms. 'No Erasin'' is the upbeat, easy to like and catchy as hell lead track (and single). I've enjoyed it from the start and I'm still enjoying it. It's immediately memorable and the layered Motown harmonies are trademark Perry. 'We're Still Here' is the second song and it's straight into ballad territory as expected. This track is very smooth, very moody and features a more direct, unfiltered lead vocal that is textured with modern production effects and soulful harmonies. The chorus isn't big, but it's cool. Compared to the rest of the album's ballads, it almost feels "up", especially with the chorus. 'Most Of All' is a co-write with the great Randy Goodrum and features a wonderful heartfelt vocal, one that is both sparse and smooth, with just Perry's voice and a grand piano. The chorus lifts the tempo slightly as does Perry's voice. It is not unlike 'Strange Medicine' and its slower moments, plus a nice guitar solo and plenty of soul. 'No More Cryin'' is yet another ballad, but each track has its own vibe, thus making the album far more enjoyable overall. This track has a touch of the Memphis Blues about it and immediately reminds me of old-school Perry. The chorus lifts the tempo and has some cool modern guitar riffing. 'In The Rain' is something really special; a very personal, very emotional piano ballad that's formed with just a warm, soulful vocal, the piano and some lush orchestration. The vocal is amazing, very raw and haunting, and it includes Perry's most ambitious high notes on the album. I can't praise that enough and the vocal melody truly makes the song. 'Sun Shines Grey' is co-written with famed guitarist John 5 and producer Thom Flowers. We've found the album's other rocker here and it reminds me of modern-day Rick Springfield mixed with Journey's 'Can't Tame The Lion' with John 5 delivering a cool solo. 'You Belong To Me' is another soft piano ballad with accompanying string orchestration and an ultra-smooth and soulful vocal. There's some rasp in that voice; it's aged yet still driven by those classic Perry nuances. 'Easy To Love' is another standout ballad. This one is characterised by some percussion and organ accompanying a slow, steady Motown style vocal. The chorus jumps in tempo with some classic Perry soul harmonies. This is definitely another ballad with a familiar vibe. 'I Need You' is a cover of The Beatles tune, a song that is just under three minutes in length, but this ballad features the most familiar Perry vocal sound yet! This track is certainly soft, slow and soulful... it's the theme of the album. 'We Fly' closes out the standard edition of this album and it's another unique ballad. The first minute features just Perry's vocal – talk about putting yourself out there! It's an intense song that builds as it goes with atmospheric keyboards in the background. What I do like about this release is each ballad has its own style, its own emotion and its own unique energy. Overall, this is a very contemporary album. The two rockers are both very commercial and the ballads could be lifted from any era. It's Steve "MF" Perry, but it's also very, very good.